Welcome to another installment of If My Book, the Monkeybicycle feature in which authors shed light on their recently released books by comparing them to weird things. This week Curtis Smith writes about Slaughterhouse Five: Bookmarked, his new memoir about the influence of Kurt Vonnegut’s classic novel on his own life and work, out from Ig Publishing. Billy Pilgrim crosses a threshold. Billy Pilgrim pulls a blanket from his head. A few steps. A few inches. A journey through the years. Poor Billy Pilgrim, a tumbleweed blown across the desert of time, falling back here, scurrying forward there. If Kurt Vonnegut’s Slaughterhouse Five: Bookmarked were a board game, it would be Chutes and Ladders, only the final space, the square marked with the sought-after blue ribbon and the number 100, would also be the first space, which would also be every space between. And on and on and on . . . If Kurt Vonnegut’s Slaughterhouse Five: Bookmarked were an elementary school report card, it would earn A’s in science and history. But the red U of unsatisfactory would wait in the grids for Neatness (so many loose ends) and Plays Well with Others (perhaps someone will tally the book’s death count—I could, but it would pain my already bruised heart). Consider the characters Billy Pilgrim encounters. The cattle-car hobo who endlessly repeats, “This ain’t so bad” then dies before the next sunrise. The British POWs and their bawdy performance of Cinderella. The sadist who literally dies walking in another man’s shoes. If Kurt Vonnegut’s Slaughterhouse Five: Bookmarked were a baseball team, it would be the 1993 Philadelphia Phillies. Wild Thing and Dutch, The Dude and Kruker. A bunch of misfits. A cast of characters from a beer-swilling era long gone. Outcasts who glimpsed the promised land but never reached it. If Kurt Vonnegut’s Slaughterhouse Five: Bookmarked were a car, it would be my old VW Dasher. A vehicle full of shakes and rattles. Somehow that car propelled itself down the open stretches of I-80 in Pennsylvania’s desolate northern tier. Breakdown never far, the engine’s coughs and complaints, the antifreeze and extra quarts of oil I kept on hand. Each mile threatened disaster, my eyes on the dash’s lights. Yet eventually I arrived, a miracle of misfiring mechanics, a journey of fits and prayers. If Kurt Vonnegut’s Slaughterhouse Five: Bookmarked were a painting, it would be one of the wide-eyed waifs of Margaret Keane. Billy Pilgrim made his modest fortune as an optometrist, and sometimes, in the dark of his examination room, he wept quietly as he stared into the eyes of his patients. Billy Pilgrim knew the horrors we record with our eyes. He understood one’s eyes were always open. He understood we could never shut out the deeds of our kind. Curtis Smith has published over one hundred stories and essays, and his work has been cited by The Best American Short Stories, The Best American Mystery Stories, and The Best American Spiritual Writing. His most recent books are Beasts and Men (stories, Press 53) and Communion (essays, Dock Street Press). 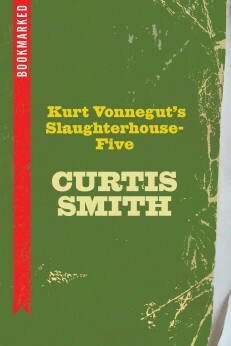 His take on Slaughterhouse-Five is one of the initial offerings of Ig Publishing’s new Bookmarked Series. Find out more at curtisjsmith.com, or connect with him on Facebook at www.facebook.com/curtis.smith2 or on Twitter at @curtis_j_smith.